The red palm weevil (Rhynchophorus ferrugineus) is a bug local tropical areas of Southeast Asia are a vital nuisance of coconut (Cocos nucifera L.). Trade is the fundamental driver of its worldwide spread development in the Mediterranean locale and the close East. In its local reach Rhyncophorus ferrugineus postures financial issues in the loss of coconut harvest stays controlled commonly. However it extremely well adapted to the new environment development by tending to new species, for example, the date palm (Phoenix dactylifera L.) creating genuine monetary issues. 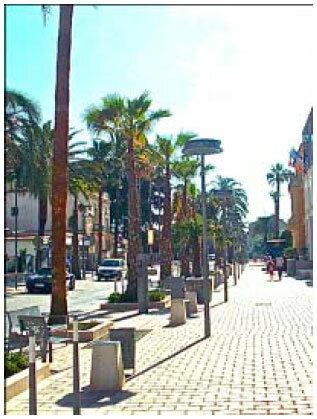 Eventually, it changes the tourists scenes in Spain and France, tending to the Canary palm (Phoenix canariensis Chabaud) and consequently that the European Union for a long times an Action Plan against red palm weevil, considering observing the development and import of palm, mindfulness and plagued palms demolition arrangement. On the other hand, looking ahead in hopes of a fight developer effective means pushed through a study on the behaviour and biology of the weevil either in the wild or in its amplified territory. Today in our globalized world we regularly discuss monetary and human trades. In any case, we infrequently talk about exchange plants and animals. Perhaps, people are not habituated always to measure the impact of import and trade of fauna and flora. The Red Palm Weevil (RPW), Rhynchophorus ferrugineus (Olivier, 1790), constitutes today one widespread pest of palm species in Asia and the Mediterranean basin that recently colonized the New World (Giblin-Davis et al., 2013). Native to South Asia and Southeast Asia, this species was originally a threat of moderate importance to coconut plantations. However, this weevil saw its scope of event to a great expanded in the most recent two decades because of the development of enigmatically pervaded palm trees around the world. It is viewed as a key pest of coconut and date palm plantations and has been responsible for the disappearance of ornamental palm trees, notably Phoenix canariensis, from the landscape of Southern Europe and North Africa. Moreover if its invasion remains unstopped it is feared that could cause major ecological and economic damage in new areas, namely the Neotropics. In this study, an outline of the late intrusion history of this species is introduced alongside the diverse control estimations connected in the distinctive influenced zones. Finally, some future research lines are presented within the framework of an integrated pest management of this species. In its current range, the RPW is rather polyphagous, having several palm species as primary hosts (Table 1) and Agave americana L. as a secondary host (Murphy and Briscoe, 1999; EPPO., 2008; Giblin-Davis et al., 2013). Considering economical impact extent, the RPW emerges a major pest of coconut (Cocos nucifera), date palm (Phoenix dactylifera) and some ornamental palm trees, especially the Canary Islands Date Palm (CIDP), Phoenix canariensis Chabaud. Rhynchophorus ferrugineus begins the infection of its host by injury, such as cutting fins or tender areas like the apical zones, armpit palms digging gallery, not always visible to the primary infection. Its presence by necrosis, the oozing of a brown viscous liquid nauseous, or by the presence of mounds milled fibers at the galleries of the inlet (perforation on the surface of the trunk), or to the apex (bud terminal) (Fig. 1a and b). When infection is more advanced, stipe little break since weakened by the galleries. When the apex is reached, there is a collapse and a sudden drying of palms, sometimes abnormal inclination of the canopy which takes an umbrella shape (Fig. 1c). This is due to the destruction of the vascular tissue by nibbling larvae. Note also atrophy of the terminal bud and crown. Heavily attacked trees lose all their palms and rotting of the trunk. The death of the palm is so imminent (Fig. 1d). Any sound pest management strategy relies on a complete understanding of the general biology of the species; including its life cycle and behaviour, as well as it correct identification. Taxonomy: The RPW, Rhynchophorus ferrugineus (Olivier, 1790) is one of the ca. 60000 species of weevil currently described. It belongs to the family Dryophthoridae, subfamily Rhynchophorinae and tribe Rhynchophorini (Bouchard et al., 2011). The genus Rhynchophorus belongs to RPW that has a pan tropical and subtropical distribution, comprehending in total 10 species (Wattanapongsiri, 1966; Hallett et al., 2004; Rugman-Jones et al., 2013). These palm weevils are relatively large insects with the adults attaining 5 cm long and 2 cm wide, whilst the larvae could reach 6.4 cm long and 2.5 cm wide (Giblin-Davis, 2001). The identification of specimens of genus Rhynchophorus is based on the analysis of a set of traits including the pronotum and scutellum, mandibles shape and the dorsal, lateral and ventral aspects of the cephalic capsule including the basal and distal submentum and chetotaxy (Fig. 2) (Wattanapongsiri, 1966; Giblin-Davis et al., 2013). These traits are considered to be sufficient to distinguish the RPW from other similar species like R. phoenicis (Fabricius, 1801) or R. quadrangulus Quedenfeldt, 1888 and they were summarized into an identification key by Giblin-Davis et al. (2013). The RPW shows a remarkable colour polymorphism (Fig. 2) that has led to the former description of different taxa within this species. Recently, based on molecular studies, R. vulneratus (Panzer, 1798), morphologically indistinguishable from the RPW and previously subsumed into the latter (Hallett et al., 2004) was proposed to be reinstated, making the immediate identification of RPW virtually impossible (Rugman-Jones et al., 2013). However in its natural range of occurrence both species only overlap in Peninsular Malaysia and from all invasive population sampled, the R. vulneratus haplotype was only detected in the USA (Rugman-Jones et al., 2013). Life cycle: The cryptic boring behavior of the RPW is a trait that has contributed for its invasive potential. As the off shoots or whole palm trees in the first stages of infestation dont show any clear symptoms, the transport of this plant material with larvae and pupae of the RPW explains the notable invasiveness of this species. Furthermore the images were shown to disperse quite well, as mark-release-recapture studies revealed that these insects can move about 7 km in less than week (Abbas et al., 2006). While dispersing they seem to be attracted by ferrugineol (4-methyl-5-nonanol), an aggregation pheromone that especially has an effect on females, which are twice as attracted as males (Hallett et al., 1993; Faleiro, 2009). The attractive effect of ferrugineol acts synergistically with host palm specific kairomones, typically early fermentation associated volatiles like ethyl esters and ethanol (Giblin-Davis et al., 1996). After copulation, that characteristically involve multiple inseminations to assure fertility, females disperse in search of oviposition sites. They make a hole into the host tissue, usually the petiole base of the palm leaves, at the end of which they lay one egg. The oviposition holes are often clustered close together. During their lifespan as gravid females around 120 days they could lay up to 530 eggs, being the mean number around 250 eggs. The lower temperature threshold for the egg stage is 13.1°C (Dembilio and Jacas, 2011). Eggs hatch after 2-4 days (at 26°C and 60% RH, (Salama and Abdel Razek, 2002) , into the apodous first instar larvae (Fig. 3). The full larval development, whose duration depends upon available host nutrition, temperature and humidity, comprehends 13 instars of increasing size and potential host damage at every molt (Giblin-Davis et al., 2013). Larvae are typically curculioniform, larvae are about 4 cm long at the last larval stage. They feed on all the internal tissues of the palm by digging deep galleries in the palms of the palm. The galleries are then filled with debris mixed with the plant exudates which the ferment. This fermentation produces heat up to 40°C, that is favorable to the development of larvae whatever the outside temperature. They are yellowish and the galleries when they are numerous and cause fragility palms. The larval stage is the stage known harmful and lasts between 36-78 days. At maturity the larva migrate periphery and form a cocoon with plant fiber. It is in this cocoon the larvae pupate. The formed cocoon and measures 8×3.5 cm. This stage lasts between 4 and 17 days, resulting imago (adult) (Ghosh, 1912; Leefmans, 1920; Ghosh, 1923; Lepesme et al., 1947; Nirula et al., 1953; Nirula, 1956; Faghih, 1996; Muralidharan et al., 2000). All stages of their life cycle are on the same tree. It can be described as monoxenous parasitic cycle. Furthermore all stages coexist, that is why it is difficult to count the number of cycles performed Rhynchophorus ferrugineus year. Especially as more palms are infected for a long time over their fermentation, so the internal high temperature and thereby speeding up the development cycle. Interactions with other organisms: Although few studies have been conducted on natural enemies and symbionts of Rhynchophorus (Murphy and Briscoe, 1999; Faleiro, 2006; Mazza et al., 2014) recently presented a comprehensive overview on this topic. Cytoplasmic Polyhedrosis Virus (CVP) infection in the late larval stage results in deformed adults, checking substantially the insect population (Gopinadhan et al., 1990). Different bacteria have been isolated from RPW, namely Bacillus thuringiensis Berliner subsp. kurstaki, B. megatherium de Bary, B. laterosporus Laubach and B. sphaericus Meyer and Neide from larvae and adults in Egypt (Alfazairy et al., 2003; Salama et al., 2004) and Pseudomonas aeruginosa in India (Banerjee and Dangar, 1995). The latter mostly affects the smaller larvae, probably due to lack of antimicrobial cuticular compounds in the first instars (Mazza et al., 2011). Fungi can also affect the RPW fitness, as it is the case of the entomo-pathogenic fungi Beauveria bassiana (Bals.) Vuill, infecting eggs, larvae and adults (El-Sufty et al., 2009), Metarhizium anisopliae (Metchnikoff) Sorokin and Metarhizium pingshaense (Cito et al., 2014). B. bassiana is lethal to the primarily infected weevils and sublethal to other adults in contact with the infected individuals, by lowering their reproductive fitness (Dembilio et al., 2010a; Llacer et al., 2013). The RPG is found in association with some phoretic nematodes. Teratorhabditis synpapillata and Praecocilenchus ferrruginophorus were until now the only reported nematode associates of this weevil species (Rao and Reddy, 1980; Kanzaki et al., 2008) Mononchoides sp., Teratorhabditis sp. and Koerneria sp. have recently isolated from RPW in Southern Italy (Oreste et al., 2013). Both T. synpapillata and P. ferrruginophorus do not cause any extra harm to the host palms. However the weevils Dynamis borassi and Metamasius hemipterus and also R. palmarum (Linnaeus, 1758), a closely related species, are vectors of Bursaphelenchus cocophilus (Cobb) Baujard 1989 the Red Ring Nematode (RRN), etiologic agent of Red Ring Disease (RRD) of palm trees in the neotropics (Giblin-Davis, 1993). Since RPG has recently colonized the neotropics there is a real threat of the RRD being carried also by this species. This is aggravated by the fact that D. borassi and M. hemipterus have also ferrugineol as their aggregation pheromone, making the chance of the RRN transfer to RPG rather likely (Giblin-Davis et al., 2013). There are also entomopathogenic nematodes associated with the RPW, as it is the case of Steinernema sp. naturally infecting RPW adults in Saudi Arabia (Saleh et al., 2011) Phoretic and parasitic mites have also been described from the RPW and some insects species constitute important predators of the RPW, especially during the egg and larval stage (Mazza et al., 2014). An example of this is the earwigs, Chelisoches morio (Fabricius, 1775) in the canopy of coconut plantations in India (Abraham and Kurian, 1974; Mazza et al., 2014) and Euborellia annulipes (Lucas, 1847) in RPW-infested palms in Sicily (Massa and Lo Verde, 2008; Mazza et al., 2014). In Sri Lanka the predatory bug Platymeris laevicollis Distant was reported to prey on RPW (Reginald, 1973; Mazza et al., 2014). Two parasitoid species are reported to prey on RPW; the sarcophagid fly Sarcophaga fuscicauda Bottcher, 1912attacks adults in South India (Iyer, 1940; Mazza et al., 2014) and the scollid wasp Scolia erratica Smith 1857 in Malaysia (Burkill, 1917; Mazza et al., 2014). The RPW seem to benefit from the feeding activity of scarabeid beetles of the genus Oryctes, which facilitates the infestation of palms crown by this weevil (Murphy and Briscoe, 1999). Some mammal and bird species are also reported to feed on RPW, although their impact on RPW populations is negligible (Mazza et al., 2014). Distribution and invasion history: The RPW is native to South Asia, in India and Sri Lanka and Southeast Asia, where it occurs in Indochina and in the Philippines. R. vulneratus, previously synonymized under R. ferrugineus, overlaps with RPW in Thai-Malay Peninsula, occurring also in Indonesia, in the islands of Sumatra, Java and Bali (Rugman-Jones et al., 2013). The RPW reached Japan in 1975, where it affects CIDP. However, major damage to palm trees has only occurred from 1998 onwards (Abe et al., 2009). In China it was first detected in Fujian in the 1990s and has expanded north and inwards since then, chiefly affecting CIDP and in the Mediterranean region (Fig. 4), it was first detected in Egypt in 1992, in date palm plantations (Yuezhong et al., 2009). It arrived in Europe through Spain in 1994 where it invades throughout Europe (EPPO., 2008) and has expanded ever since to Italy, France, Portugal and Slovenia, affecting especially CIDP (Giblin-Davis et al., 2013). In 2005, it also invaded the Canary Islands, the native range of CIDP, where it posed a serious conservation threat to this palm species. However, the introduced population was completely eradicated in 2010 (Giblin-Davis et al., 2013). Populations in the Middle East, although located close to Egyptian populations revealed to form a distinct haplotypic lineage, suggesting that the invasion in the east Mediterranean basin is the result of at least two independent introductions from East Asia (El-Mergawy et al., 2011). More recently, in 2008, the RPW was first detected in the Neotropics, more precisely in Curaçao and Aruba in date palms (Giblin-Davis et al., 2013). In 2010, R. vulneratus was discovered in California, being the first recorded invasion focus of this species (Rugman-Jones et al., 2013). Economic impacts: The red palm weevil is subservient to the palms, limiting its spread. Then one could believe that he has little impact on the economic level. Far from it, in some countries the palm trees have a high economic value. Case in point, the date palm (Phoenix dactylifera) is mass-delivered in Africa and the Middle East and is traded everywhere throughout the world. In these zones of conventional generation additionally speaks to subsistence horticulture. Note that for, 1 million people to date are an important nutritional element contributing to food security. Be that as it may in late decades, profit date palms to essentially bring down, or around 30% of production that may be lost because of the distinctive parasites that assault date palms. Rhynchophorus ferrugineus is presently representing to the best adversary of these harvests (FAO., 2004). In Europe especially the palms have ornamental value, planted by individuals or municipalities. In France, tourists gathering to acknowledge around 7000 palm Hyères-les-Palmiers in the PACA region (Fig. 5). This city is also important nursery palm and exports throughout Europe. Also, in Europe it is mainly grown in the Canary palm (Phoenix canariensis), Washingtonia sp. and Trachycarpus fortunei, all three hit by the plague Rhynchophorus ferrugineus. Note the presence of some native palms as Chamaerops and Phoenix theophrasti affected in Crete. However, there is no report that shows the economic impact of red palm weevil in Europe. In its native range the red palm weevil is an especially destructive coconut tree. A yearly loss of 1-2% is noted trees. Ganapathy et al. (1992) reported that 34% of such coconut ranches in the State Karala (India) affected. Screening: Screening for infection with the red palm weevil is very difficult because infected palm does not quickly symptoms. And when they appear it is too late to save the tree. Today the most common method of testing is the visual detection. But often when there is concern about the state of the palm, it is too late to save the tree or avoid other infestation. That is why an inspection at the crown is indispensable. However, this requires substantial equipment such as ladders or platforms and a large workforce, returning to very important progress. Thus, the current research is directed towards the development of methods for effective early detection of infection by Rhynchophorus ferrugineus. The research focuses on the development of tools based on the analysis of odors, including through the training of specialized dogs (Lucaplant-CEYPPD project, Nakash et al., 2000) (Fig. 6). Other methods are based on the detection of the noise emitted by the larvae (acoustic detection) (Pinhas et al., 2008; Soroker et al., 2004; Hussein et al., 2010), or heat due to fermentation (via a thermal camera), or the development of electronic noses that detect the increase in CO2 fermentation (Soroker et al., 2013). These methods have shown their potential but are inapplicable to large scale since not sensitive enough or practical enough and reproducible, which makes them very effective in the fight against the red palm weevil. Biological control: Much research on the control of Rhynchophorus ferrugineus via its predators or parasites was made but all have unfortunately not been successful in the field. There was a hope with research Reginald (1973), noted the presence of Platymerus laevicollis was imported to Sri Lanka from Western Samoa as a possible predator Oryctes rhinoceros but that proved prefer Rhynchophorus ferrugineus. There have also been studies to evaluate the potential of some predators and parasites; Abraham and evil larvae per day. Now these are experimental results, which had no effect on the ground. Natural enemies of Rhynchophorus ferrugineus, pathogenic or entomophages, described in the literature are listed in Table 2. Pheromone: It was the discovery in 1993 (Hallett et al., 1993) of the aggregation pheromone produced by male 4-methyl-5-nonanol (ferrugineol), which allowed the development of trapping methods olfactory. Today pheromones are increasingly used in the fight against the red palm weevil. Many trapping methods based on the use of pheromones have been developed and all things seem more or less effective. Take the example of Vidyasagar et al. (2000) who have measured the impact of using a pheromone mass trapping system in Saudi Arabia using the aggregation pheromone, ferrugineol, 4-methyl-5-nonanol (marketed under the name of Ferrolure) and/or 4-methyl-5-nonanol+4-methyl-5-nonanone in proportion 90:10 (marketed under the name of Ferrolure+). The populaces of grown-up weevils were diminished by 4.12 weevils every trap every week in 1994-2.02 weevils per trap per week in 1997, when this framework was utilized and there was a critical lessening in the level of infestation date palm weevil amid this period. Pheromones are also used to monitor the evolution of the invasion of Rhynchophorus ferrugineus. Indeed trappings networks are installed in hazardous areas to determine as accurately as possible the situation of Rhynchophorus ferrugineus. Chemical control: Chemical control is a short-term control means. It essentially consists in the spraying of insecticides potent as imidacloprid 200 g L1 (Dembilio et al., 2010b). However, this product is not only toxic to vertebrates and but also non-environmentally friendly and are often not sufficiently effective against the larvae that are not always in contact with the insecticide. Despite these drawbacks, the use of insecticides remains even recommended to prevent future infestations, without taking into account the effects that could affect the agro-ecosystem. Also, endotherapy is useful. The endotherapy is deeply injecting a cocktail of insecticides in the palm. For this a hole is 15-25 cm long in the trunk and there is a catheter, which allows injecting the insecticide in the heart of palm (Fig. 7). It is currently still an experimental method (Nabawy, 2010). There is currently no conclusive result, but marketing is envisaged. There is much controversy about this method since it had was used to treat diseased elms in the 70 and they were weakened it because of necrosis that developed at the site of injection. Palm trees are more susceptible to this kind of necrosis of themselves as "herbs" (monocots) so do not possess meristem able to fill the wound. The RPW IPM also comprehends a series of phyto-sanitary preventive and curative procedures, which aim both to reduce the chance of initial infestation and to recover plants that have already been affected by the insect, respectively. As RPW is attracted by injured plant tissue, all unnecessary pruning in the plant must be avoided (Faleiro and Satarkar, 2003; Faleiro, 2006). In coconut, when leaves are cut from the palms, stumps of not less than 1 m may be left on the trees in order to prevent successful inward movement of the larvae through the cut end (Faleiro, 2006). 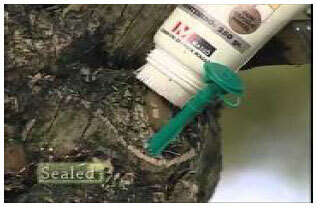 General prevention actions target the most vulnerable trees to RPW attack (i.e., trees with less than 20 years and individuals with wounds) and include spraying of cut scars with insecticide, in order to prevent egg laying; or protection of the wounds, covering them with tar or cement in order to reduce potential infestation loci (Abraham, 1971). Spraying of cut scars with insecticide must be carried immediately after the leaf is cut and before the plant tissue dries, both in date palms and CIDP (Faleiro, 2006). Additionally, in coconut plantations periodic frond axis filling with Benzene Hexa Chloride (BHC) dust and sand has shown to be useful in preventing infestation by Oryctes beetles and RPW (Faleiro, 2006). In date palm plantations, dipping offshoots in fipronil 3.5% (Thripguard 35 SCTM) or Imidacloprid 35% (Confidor 350 SCTM) is considered a good quarantine procedure (Al-Shawaf et al., 2013). Some spray lances that soak the palms stipe from the top to the bottom were devised, representing a less environmentally harmful alternative to traditional sprayers (Faleiro, 2006). Selective plant breeding regarding host plant resistance could also play a role as a long term IPM option against RPW (Faleiro, 2006). In date palms, sugar and calcium content of cultivar appears to influence RPW survival, with some cultivars, like Mazafati, being more prone to infestation (Farazmand, 2002). Similarly, some coconut cultivars (e.g., Malayan Yellow Dwarf) appear to be less affected by RPW (Faleiro and Rangnekar, 2001). In date palm plantations, irrigation regime seems to affect RPW infestation prevalence. The continuous contact of water at the stipe base creates an environment favourable for RPW egg-laying. Abandonment of flood irrigation would help in controlling RPW in the Middle East (Aldryhim and Al-Bukiri, 2003). Curative interventions include repeated stipe injection (drill-pour-plug) and fumigation, using aluminium phosphide tablets (Lakshmanan et al., 1972; Faleiro, 2006). In the case of coconut, root feeding with monocrotophos (10 mL plant1) is also beneficial (Rao et al., 1989). However, the application of this last technique is laborious and therefore it is not very popular (Faleiro, 2006). Stipe injection is by far the most widely used technique. In coconut plantations of India, injection a solution of 1% carbaryl 50 WP (Faleiro, 2006) is used. In Saudi Arabia IPM program, insecticides used in curative treatment include supracide® (Gowan Co., Yuma, Arizona, USA), Metasystox® (Bayer, Isando, Germany), cypermethrin, dimethoate (27.8%), Chlorpyrifos (22.2%) and trichlorphon (Vidyasagar et al., 2000). In Spain, curative treatment in CIDP is applied using a 4-mm polyethylene pipeline holding 2-4 micro-sprinklers that is fixed on the stipe and reaching the palm tree crown; abamectin, chlorpyrifos, imidacloprid, phosmet and thiametoxam and a nematode-chitosam formulation are used. In CIDP, in Spain, arboreal surgery is also considered in the curative treatment, being the damaged tissues excised from the palm (Giblin-Davis et al., 2013). In all cases, severely damaged and dead palms should be eliminated, in order to restrain the infestation (Faleiro, 2006; Giblin-Davis et al., 2013). The current extent of the RPW impact on palm trees is a consequence of the inadvertent movement of cryptically infested plants across different regions and countries. Therefore, the effective control of its ongoing expansion is dependent on a legal framework that effectively regulates the imports of palm trees out of the affected regions. In Europe, where RPW has been responsible for massive mortality of CIDP, any palm used in a new plantation, landscape project or garden should have a valid EU Plant Passport. The movement and trade of palm trees in Europe is conditioned by the Commission Decision 2007/365/EC on emergency measures against the introduction and spread within the European Union of RPW (OJEU., 2007). This decision was modified for the last time in 2010 (OJEU., 2010) and was meanwhile incorporated into national, regional and local laws. It defines quarantine procedures by establishing demarcated infested areas and regulating import requirements and conditions for movement of palms arriving in the EU. As another example, the United Arab Emirates banned the import of palms from any region where RPW is known to occur (MOEW). Due to its impact on palm trees all over the world, a comprehensive account of the biology and integrated pest management of palm weevils and especially of the RPW, is now available for being integrated in action plans against these insects all over their distributional range. However, some issues like alternative methods for the early detection of this pest, or the mechanisms behind host plant resistance in some palm species, remain insufficiently studied (Giblin-Davis et al., 2013) and thus, require further research. In an operational point of view, there is still a lack of international legal enforcement necessary to control the ongoing expansion of this invasive species. A standardized quarantine protocol at an international level is most needed. The taxonomic status of the RPW is not yet fully resolved (Rugman-Jones et al., 2013). Further studies integrating both morphological and molecular data could unveil cryptic diversity within this taxon. Finally, future works should address other major shortfalls identified in the control of the RPW in the field, these include: the difficulty of involving homeowners in the IPM process, the lack of highly effective, environmentally safe plant protection strategies adequate for urban areas and the incomplete knowledge of the biology and ecology of R. ferrugineus developing in P. canariensis all over its nonnative range. Abbas, M.S.T., S.B. Hanounik, A.S. Shahdad and S.A. Al-Bagham, 2006. Aggregation pheromone traps, a major component of IPM strategy for the red palm weevil, Rhynchophorus ferrugineus in date palms (Colleopetra: Curculionidae). J. Pest Sci., 79: 69-73. Abe, F., K. Hata and K. Sone, 2009. Life history of the red palm weevil, Rhynchophorus ferrugineus (Coleoptera: Dryophtoridae), in Southern Japan. Florida Entomol., 92: 421-425. Abraham, V.A. and C. Kurian, 1974. Chelisoches moris F. (Forficulidae: Dermaptera), a predator on eggs and early instar grubs of the red palm weevil Rhynchophorus ferrugineus F. (Curculionidae: Coleoptera). J. Plant. Crops, 1: 147-152. Abraham, V.A., 1971. Prevention of red palm weevil entry into coconut palms through wounds. (Rhynchophorus ferrugineus). Mysore J. Agric. Sci., 5: 121-122. Al-Shawaf, A.M., A. Al-Shagag, M. Al-Bagshi, S. Al-Saroj and S. Al-Bather et al., 2013. A quarantine protocol against red palm weevil Rhynchophorus ferrugineus (olivier) (Coleptera: Curculiondae) in date palm. J. Plant Protect. Res., 53: 409-415. Aldryhim, Y. and S. Al-Bukiri, 2003. Effect of irrigation on within-grove distribution of red palm weevil Rhynchophorus ferrugineus. Agric. Mar. Sci., 8: 47-49. Alfazairy, A.A., R. Hendi, A.M. El-Minshawy and H.H. Karam, 2003. Entomopathogenic agents isolated from 19 coleopteran insect pests in Egypt. Egypt. J. Biol. Pest Control, Vol. 13. Avand-Faghih, A., 2004. Identification and implementation of agricultural plant pheromone synergists weevil Rhynchophorus ferrugineus (Olivier) 1790. Ph.D. Thesis, University in Paris, France. Ayyar, T.V.R., 1940. A Hand Book of Economic Entomology for South India. Government Press, Madras, pp: 328-336. Banerjee, A. and T.K. Dangar, 1995. Pseudomonas aeruginosa, a facultative pathogen of red palm weevil, Rhynchophorus ferrugineus. World J. Microbiol. Biotechnol., 11: 618-620. Bouchard, P., Y. Bousquet, A.E. Davies, M.A. Alonso-Zarazaga and J.F. Lawrence et al., 2011. Family-group names in Coleoptera (Insecta). ZooKeys, 1: 1-972. Burkill, I.H., 1917. Scolia erratica (Smith), a parasite of the red coconut weevil (Rhynchophorus ferrugineus). Garden Bull., 1: 399-400. Cito, A., G. Mazza, A. Strangi, C. Benvenuti and G.P. Barzanti et al., 2014. Characterization and comparison of Metarhizium strains isolated from Rhynchophorus ferrugineus. FEMS Microbiol. Lett., 355: 108-115. Dembilio, O. and J.A. Jacas, 2011. Basic bio-ecological parameters of the invasive red palm weevil, Rhynchophorus ferrugineus (Coleoptera: Curculionidae), in Phoenix canariensis under Mediterranean climate. Bull. Entomol. Res., 101: 153-163. Dembilio, O., E. Llacer, M. del Mar Martinez de Altube and J.A. Jacas, 2010. Field efficacy of imidacloprid and Steinernema carpocapsae in a chitosan formulation against the red palm weevil Rhynchophorus ferrugineus (Coleoptera: Curculionidae) in Phoenix canariensis. Pest Manage. Sci., 66: 365-370. Dembilio, O., E. Quesada-Moraga, C. Santiago-Alvarez and J.A. Jacas, 2010. Potential of an indigenous strain of the entomopathogenic fungus Beauveria bassiana as a biological control agent against the Red Palm Weevil, Rhynchophorus ferrugineus. J. Invertebrate Pathol., 104: 214-221. EPPO., 2008. 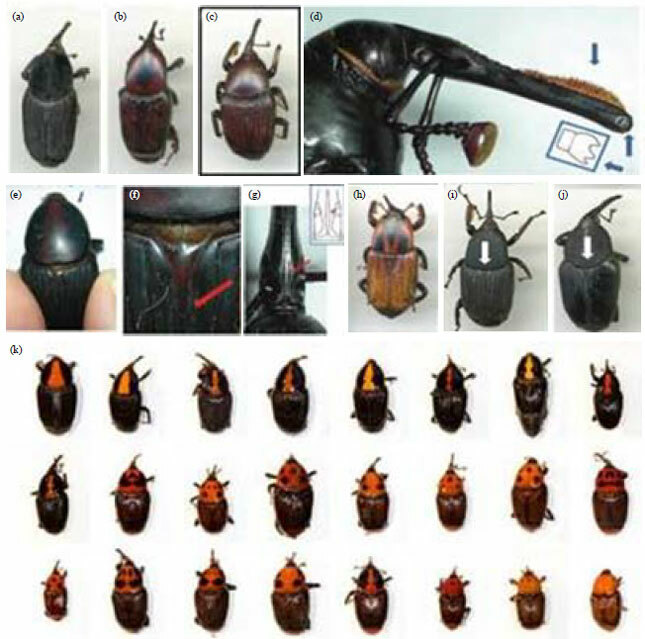 Data sheets on quarantine pests: Rhynchophorus ferrugineus. European and Mediterranean Plant Protection Organization Bulletin, Volume 38, pp:55-59. El-Mergawy, R.A.A.M., N. Faure, M.I. Nasr, A. Avand-Faghih, D. Rochat and J.F. Silvain, 2011. Mitochondrial genetic variation and invasion history of red palm weevil, Rhynchophorus ferrugineus (Coleoptera: Curculionidae), in Middle-East and Mediterranean Basin. Int. J. Agric. Biol., 13: 631-637. El-Sufty, R., S.A. Al-Awash, S. Al-Bgham, A.S. Shahdad and A.H. Al-Bathra, 2009. Pathogenicity of the fungs Beauveria bassiana (Bals.) vuill to the red palm weevil, Rhynchophorus ferrugineus (Oliv.)(Col. : Curculionidae) under laboratory and field conditions. Egypt. J. Biol. Pest Control, 19: 81-85. FAO., 2004. Global Date Production at Risk Due to Pests and Diseases: FAO Launches Global Date Palm Network. FAO., Rome, Italy. Faghih, A.A., 1996. The biology of red palm weevil, Rhynchophorus ferrugineus Oliv. (Coleoptera, Curculionidae) in Saravan region (Sistan & Balouchistan province, Iran). Applied Entomol. Phytopathol., 63: 16-18. Faleiro, J.R. and P.A. Rangnekar, 2001. Ovipositional preference of red palm weevil Rhynchophorus ferrugineus oliv. to coconut cultivars. Indian Coconut J., 32: 22-23. Faleiro, J.R. and V.R. Satarkar, 2003. Pheromone traps for the management of red palm weevil-A key pest of coconut. ICAR Research Complex for Goa, Ela, Old Goa, India, pp: 1-8. Faleiro, J.R., 2006. A review of the issues and management of the red palm weevil Rhynchophorus ferrugineus (Coleoptera: Rhynchophoridae) in coconut and date palm during the last one hundred years. Int. J. Trop. Insect Sci., 26: 135-154. Faleiro, J.R., 2009. Testing and refining protocols for area-wide management of Red Palm Weevil (RPW), Rhynchophorus ferrugineus (Olivier) in date agro-ecosystems of Al-Hassa, Saudi Arabia. Final report, Date Palm Research Centre, King Faisal University, Al Hassa, Saudi Arabia, pp: 36. Farazmand, H., 2002. Investigation on the reasons of food preference of red palm weevil, Rhynchophorus ferrugineus (Oliv.). Applied Entomol. Phytopathol., 70: 49-62. Ganapathy, T., K. Rajamanickam, T.S. Raveendran, A.C. Lourduraj and F.J.S. Kennedy, 1992. Status of coconut cultivation in Pollachi tract. II Prevalence of pests and diseases. Indian Coconut J. Cochin, 23: 4-6. Ghazavi, M. and A. Avand-Faghih, 2002. Isolation of two entomopathogenic fungi on red palm weevil, Rhynchophorus ferrugineus (Olivier) (Col., Curculionidae) in Iran. Applied Entomol. Phytopathol., 9: 44-45. Ghosh, C.C., 1912. Life history of Indian insetcs. III. The rhinoceros beetle (Oryctes rhinoceros) and the red palm weevil (Rhynchophorus ferrugineus). Memoires of the Department of Agriculture of India, Vol. 2, pp: 190-217. Ghosh, C.C., 1923. The palm beetles in Burma with notes on other pests. Bulletin of the Department of Agriculture, Burma, Volume 190, pp: 1-40. Giblin-Davis, R.M., 1993. Interactions of Nematodes with Insects. In: Nematode Interactions, Khan, M.W. (Ed.). Chapman and Hall, New York, pp: 302-345. Giblin-Davis, R.M., 2001. Borers. In: Insects on Palms, Howard, F.W., D. Moore, R.M. Giblin-Davis and R. Abad (Eds.). CABI Publishing, London, pp: 267-304. Giblin-Davis, R.M., A.C. Oehlschlager, A. Perez, G. Gries and R. Gries et al., 1996. Chemical and behavioral ecology of palm weevils (Curculionidae: Rhynchophorinae). Florida Entomol., 79: 153-167. Giblin-Davis, R.M., J.R. Faleiro, J.E. Jacas, J.E. Pena and P.S.P.V. Vidyasagar, 2013. Biology and Management of the Red Palm Weevil, Rhynchophorus ferrugineus. In: Potential Invasive Pests of Agricultural Crops, Pena J.E. (Ed.). CABI., Wallingford, pp: 1-34. Gopinadhan, P.B., N. Mohandas and K.P.V. Nair, 1990. Cytoplasmic polyhedrosis virus infecting red palm weevil of coconut. Curr. 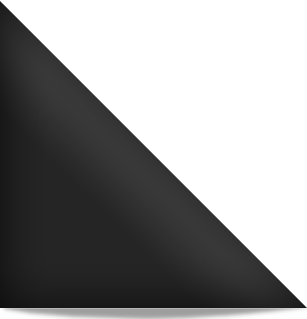 Sci., 59: 577-580. Hallett, R.H., B.J. Crespi and J.H. Borden, 2004. Synonymy of Rhynchophorus ferrugineus (Olivier), 1790 and R. vulneratus (Panzer), 1798 (Coleoptera, Curculionidae, Rhynchophorinae). J. Natural Hist., 38: 2863-2882. Hallett, R.H., G. Gries, R. Gries, J.H. Borden and E. Czyzewska et al., 1993. Aggregation pheromones of two Asian palm weevils, Rhynchophorus ferrugineus and R. vulneratus. Naturwissenschaften, 80: 328-331. Hussein, W.B., M.A. Hussein and T. Becker, 2010. Detection of the red palm weevil Rhynchophorus ferrugineus using its bioacoustics features. Bioacoustics, 19: 177-194. Iyer, C.S.V., 1940. Two interesting and unrecorded enemies of the palm beetle, Rhynchophorus ferrugineus. Indian J. Entomol., 2: 98-98. Kanzaki, N., F. Abe, R.M. Giblin-Davis, K. Kiontke, D.H. Fitch, K. Hata and K. Sone, 2008. Teratorhabditis synpapillata Sudhaus, 1985 (Rhabditida: Rhabditidae) is an associate of the red palm weevil, Rhynchophorus ferrugineus (Coleoptera: Curculionidae). Nematology, 10: 207-218. Kurian, C., 1978. Diseases, Pests and Weeds in Tropical Crops. John Wiley and Sons Ltd., New York, pp: 410-412. Lakshmanan, P.L., P.V. Subba-Rao and T.R. Subramaniam, 1972. A note on the control of the coconut red palm weevil, Rhynchophorus ferrugineus with certain new chemicals. Madras Agric. J., 59: 638-639. Leefmans, S., 1920. De Palm Sunuitkerer (Rhynchophorus ferrugineus Oliv.). Vol. 43 Mededelingen van het Institute, Voor Plantenziekten, Buitenzorg, pp: 1-90. Lepesme, P., J. Ghesquiere, J. Bourgogne, E. Cairaschi, R. Paulian and A. Villiers, 1947. Les Insectes Des Palmiers. Paul Lechevalier, Paris, pp: 614-917, (In French). Llacer, E., C. Santiago-Alvarez and J.A. Jacas, 2013. Could sterile males be used to vector a microbiological control agent? The case of Rhynchophorus ferrugineus and Beauveria bassiana. Bull. Entomol. Res., 103: 241-250. Massa, B. and G. Lo Verde, 2008. Natural enemies of the red palm weevil. Scientific Research on the Red Weevil and other Pests of Palm Trees in Sicily, Sicilian Region-Department of Agriculture and Forestry Department Infrastructural Interventions, Services Development, pp: 73-78. Mazza, G., V. Arizza, D. Baracchi, G.P. Barzanti and C. Benvenuti et al., 2011. Antimicrobial activity of the red palm weevil Rhynchophorus ferrugineus. Bull. Insectol., 64: 33-41. Mazza, G., V. Francardi, S. Simoni, C. Benvenuti and R. Cervo et al., 2014. An overview on the natural enemies of Rhynchophorus palm weevils, with focus on R. ferrugineus. Biol. Control, 77: 83-92. Muralidharan, C.M., N.N. Sodagar and U.R. Vaghasia, 2000. Survey, distribution, extent of damage, field behaviour and biology of red palm weevil, Rhynchophorus ferrugineus Oliv. on date groves of Kachchh (Gujarat). Gujarat Agric. Univ. Res. J., 25: 9-14. Murphy, S.T. and B.R. Briscoe, 1999. The red palm weevil as an alien invasive: Biology and the prospects of biological control as component of IPM. Biocontrol News Inform., 20: 35N-46N. Nabawy, M., 2010. Metwaly method endotherapic injection for palm trees: The new methods used to control the red palm weevil (Rhynchophorus ferrugineus Olivier). Acta Hortic., 882: 977-984. Nakash, J., Y. Osem and M. Kehat, 2000. 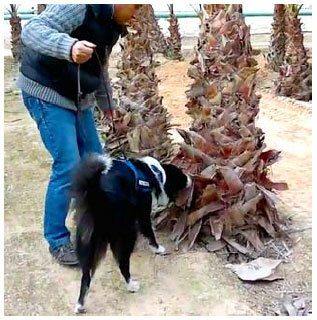 A suggestion to use dogs for detecting red palm weevil (Rhynchophorus ferrugineus) infestation in date palms in Israel. Phytoparasitica, 28: 153-155. Nirula, K.K., 1956. Investigations on the pests of coconut palm: Pest IV, Rhynchophorus ferrugineus F. Indian Coconut J., 9: 229-247. Nirula, K.K., J. Anthony and K.P.V. Menon, 1953. The red palm weevil and its control. Proceeding of the 40th Session Indian Science Congress, January 1953, Lucknow, pp: 147-148. OJEU., 2007. Commission decision 2007/365/EC of 25 May 2007 on emergency measures against the introduction and spread within the community of Rhynchophorus ferrugineus (Olivier) [notified under document number C (2007) 2161]. Official J. Eur. Union L, 139: 24-27. OJEU., 2010. Commission decision of 17 August 2010 amending decision 2007/365/EC on emergency measures to prevent the introduction into and the spread within the community of R. ferrugineus (Olivier) [notified under document number C (2010) 5640]. Official J. Eur. Union L, 226: 42-44. Peter, C., 1989. A note on the mites associated with the red palm weevil, Rhynchophorus ferrugineus Oliv. in Tamil Nadu. J. Insect Sci., 2: 160-161. Pinhas, J., V. Soroker, A. Hetzroni, A. Mizrach, M. Teicher and J. Goldberger, 2008. Automatic acoustic detection of the red palm weevil. Comput. Elect. Agric., 63: 131-139. Rao, A.G., R.P. Ramamohana, R.T. Ramamohana and K. Lakshminarayana, 1989. Studies on the effect of root feeding of systemic insecticides in the control of Red Palm Weevil, Rhynchophorus ferrugineus Fab in coconut. Indian Coconut J., 19: 12-16. Rao, P.N. and N.Y. Reddy, 1980. Description of a new nematode Praecocilenchus ferruginophorus n.sp., from weevil pests (Coleoptera) of coconut palms in South India. Rivista Parasitol., 44: 93-98. Reginald, C., 1973. Principal Insect Pests. In: Coconuts. Tropical Agriculture Series, Reginald, C. (Eds.). Longmans, London. Rugman-Jones, P.F., C.D. Hoddle, M.S. Hoddle and R. Stouthamer, 2013. The lesser of two weevils: Molecular-genetics of pest palm weevil populations confirm Rhynchophorus vulneratus (Panzer 1798) as a valid species distinct from R. ferrugineus (Olivier 1790) and reveal the global extent of both. PloS One, Vol. 8. Salama, H.S. and A.S. Abdel‐Razek, 2002. Development of the red palm weevil, Rhynchophorus ferrugineus (Olivier), (Coleoptera, Curculionidae) on natural and synthetic diets. Anzeiger fur Schadlingskunde, 75: 137-139. Salama, H.S., M.S. Foda, M.A. El-Bendary and A. Abdel-Razek, 2004. Infection of red palm weevil, Rhynchophorus ferrugineus, by spore-forming bacilli indigenous to its natural habitat in Egypt. J. Pest Sci., 77: 27-31. Saleh, M.M.E., M.A. Alheji, M.H. Alkhazal, H. Alferdan and A. Darwish, 2011. Evaluation of Steinernema sp. SA a native isolate from Saudi Arabia for controlling adults of the red palm weevil. Rhynchophorus ferrugineus (Oliver). Egypt. J. Biol. Pest Control, 21: 277-282. Soroker, V., P. Suma, A.L. Pergola, Y. Cohen, V. Alchanatis, O. Golomb and M. Brandstetter, 2013. Early detection and monitoring of red palm weevil: Approaches and challenges. Proceedings of the AFPP-PALM Pest Mediterranean Conference, January 16-18, 2013, Nice, France -. Soroker, V., Y. Nakache, U. Landau, A. Mizrach, A. Hetzroni and D. Gerling, 2004. Note: Utilization of sounding methodology to detect infestation by Rhynchophorus ferrugineus on palm offshoots. Phytoparasitica, 32: 6-8. Vidyasagar, P.S.P.V., M. Hagi, R.A. Abozuhairah, O.E. Al-Mohanna and A. Al-Saihati, 2000. Impact of mass pheromone trapping on red palm weevil: adult population and infestation level in date palm gardens of Saudi Arabia. Planter (Malaysia), 76: 347-355. Wattanapongsiri, A., 1966. A revision of the genera Rhynchophorus and Dynamis (Coleoptera: Curculionidae). Science Bulletin No. 1, Department of Agriculture, Bangkok, Thailand, pp: 328. Yuezhong, L., Z. Zeng-Rong, J. Ruiting and W. Lian-Sheng, 2009. The red palm weevil, Rhynchophorus ferrugineus (Coleoptera: Curculionidae), newly reported from Zhejiang, China and update of geographical distribution. Florida Entomol., 92: 386-387.